According to the pop psychology of the 1950’s, there were good girls and there were bad girls. 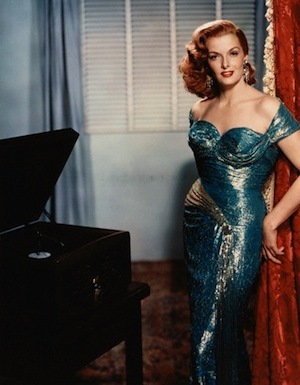 Good girls just didn’t look like Jane Russell. How could a woman, who wielded her curvaceous figure like a weapon, be anything but bad? The cross-your-heart bombshell spent most of her career playing seductive women out to get something and The Revolt of Mamie Stover (1956) is no exception. 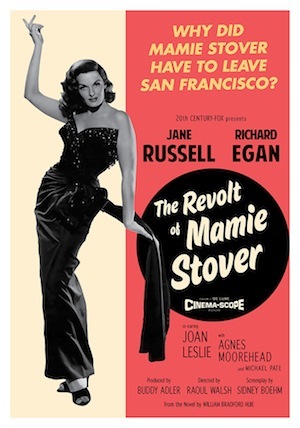 What it’s all about: With a surly backward glance, bad girl Mamie Stover (Russell) bids farewell to San Francisco. Apparently, the City by the Bay wasn’t interested in what Mamie had to offer. She’s such a bad girl, that the police have personally escorted her to the tramp steamer that will take her far, far away. How far? To the South Pacific. That’s how bad she is. This intrigues dreamy square-jawed writer Jim Blair (Richard Egan). “You’re an interesting character study,” he tells her, though it’s obvious it’s more than her character he’s interested in. When they reach port, Jim is met by his lady friend Anna lee (Joan Leslie) and his obedient manservant Aki. With her suitcase in hand, Mamie heads straight to her interview as a dancehall hostess. For those unfamiliar with this Hollywood euphemism, “dancehall hostess” is often the more delicate term used for prostitute. After Mamie has had a chance to settle into her working life, Jimmy pays her a visit. After buying twenty dollars worth of tickets, he is asked to wait for Mamie in one of the champagne rooms. Mamie has dyed her hair a vibrant red. “Sells lots more tickets,” she insists, “They’ve been calling me flaming Mamie.” With ukulele mood music in the background, she whispers sweet nothings in his ear and they decide to rekindle their close friendship. During an afternoon at the beach, Mamie sweet talks Jimmy into bank rolling some of her hard earned cash. They seal the deal with a kiss in front of the sparkling waters of a rear projection sea. Sure enough, the day that will live in infamy ultimately arrives. The film is set in 1941, but with the exception of a few vintage cars, any other attempts at period detail seem to be an afterthought. Jim watches from the terrace of his hillside home as Pearl Harbor is bombed by the Japanese (courtesy of stock footage from other Fox movies). He fights his way through the crowds to get to Mamie. While bombs explode and the other Bungalow girls run for cover, Mamie takes the time to plan for the future. “They’re all running scared,” she says of the panicking civilians outside her window, “But not me. I’m gonna buy real estate with every dollar I can raise!” Mamie immediately makes good on her promise and begins to buy all the cheap island property that she can get her hands on. Jimmy, being the all-American type that he is, immediately joins the Army. “There aren’t going to be any more numbers on your back,” he says asking her to quit her duties at The Bungalow. “I love you Mamie. Not just in private, but anywhere and everywhere.” When he returns from his tour of duty they’ll tie the knot. When a military police captain comes to The Bungalow to investigate complaints of overcharging, Mamie is given the responsibility of keeping him happy. She entertains him and the rest of the servicemen with an impromptu song. In a provocative gown designed by Travilla, Mamie sings “Keep Your Eyes On the Hands”, a song about the sensual subtleties of the hula. In a stab at respectability, Mamie talks the captain into taking her to the country club for a few rounds of golf. Respectability, however, is the last thing on his mind. Despite lying to Jimmy about her employment status, she remains true to her man. Somewhere else in the Pacific, Jimmy overhears some soldiers touting the virtues of Flaming Mamie. When he sees a pin-up of the girl he’s going to marry, the news that Mamie is still a “working girl” hits him like a bombshell, literally. When he is injured by enemy fire, he’s sent back to Honolulu to recuperate. While Jimmy waits for his beloved in the champagne room where they began their affair, the rickety phonograph in the corner plays “If You Want to See Mamie Tonight”. Apparently, Mamie has become so infamous that a song’s been written about her! When she first sees Jimmy, she’s overjoyed, but then realizes that she’s got some serious explaining to do. Jimmy, who is not in a forgiving mood, takes the high road. “Anything for a dollar Mamie? We don’t think the same about how life should be lived.” Yup, it’s the old “we’re from different worlds” brush off. Even Mamie can see that he must return to his house on the hill and the respectability of a girl like Anna Lee. With the record playing in the background (“Any lad for Mamie, would go mad for Mamie. And give up all he ever had for Mamie”) she realizes that her ambitions have driven away the one man she might have found happiness with. “If I told you that I made a fortune and given it all away, would you believe me?” a sadder but wiser Mamie asks the police officer who stands waiting for her on the dock in San Francisco. With her hair dyed back to her natural brunette, Mamie catches a ride in the squad car to the airport and her return flight home. In conclusion: Most Twentieth Century Fox productions of the late 50’s and 60’s had three things in common. They were based on best-selling novels, featured lush location photography and were shot in the grandeur of cinemascope. These prerequisites gave a film a certain amount of prestige, and prestige was an essential component in the battle to pull audiences away from television and back into theatres. Though The Revolt of Mamie Stover meets all the requirements of a prestige picture (it has Hawaiian locations, gorgeous Cinemascope photography and was based on the book by William Bradford Huie) it thankfully never achieves its lofty goals. Like the hard-knocks heroine of the title, this movie tries to be something it’s not… respectable. Despite all the highbrow gloss, it’s still the deliciously trashy tale of a bad girl and her desire for love, money and respect. Though currently unavailable on DVD, the Fox Movie Channel occasionally runs both the pan and scan and the widescreen versions of the film.